Ocean Ritz 1401 is a beautifully appointed Luxury Condo on the Beach. 1401 is ideal for well supervised large family, church, scouts and children's sports groups. Must be over 25 years old and present during the entire stay to rent this property. We do not rent to college or high school spring break groups. Unlike many of the corporate managed units in PCB, equipped strictly as rentals – we have furnished our four (4) bedroom and four (4) bath condo in the way our family enjoys for beach vacation getaways. We can use our Ocean Ritz owners cooperative to get you more condos in our building for very large groups. We also are one of the few units at the Ocean Ritz to supply free armbands and parking passes to both Ocean Ritz reserved and PCB city parking areas. Ocean Ritz 1401 is our 'Sandcastle in the Sky' that will give you that happy beach feeling both outside and inside. Although we do our best to keep the sand outside ;-). It features unique comfortable beach themed furnishings throughout, completely upgraded stainless steel kitchen appliances and full size Washer and Dryer. Freshly painted with new tile plus black out draperies so you can 'sleep in' if you feel like it. Definitely not the same 'rental packages' found in most beach condominiums. Comfortable accommodations for thirteen (13) people in beds (only 8 people over 16 years old permitted) are provided. Ocean Ritz 1401 is located on the 14th Floor - we're on the east end of the building and away from elevator and pedestrian traffic. The comfortable, sofa queen pull-out in the Great Room features a pleasant Gulf view with balcony access. The Kitchen table can sit 8 comfortably and is perfect for family meals or owner provided board games. The bedrooms and Great Room are complete with attractive ceiling fans that help you cool off during those hot summer days. The entertainment center in the great room has an electric fireplace to warm up winter vacationers after a trip to our year round heated hot tub and Sauna. The Grand Master Bedroom has a comfortable King Size Bed with pillow top mattress. It also features a giant glass door that easily opens to the smell, view and the soothing sounds of the emerald coast of the Gulf of Mexico. The Master Bedroom is also equipped with a King size Bed with pillow-top mattress. The Sea Horse Room also features a comfortable queen size pillow top mattress and a large closet. The Sea Turtle room features a comfortable twin over full bunk and a full size sleeper sofa. The kids can sit on the sofa and watch their own 3D TV. Just close the door to give the adults some privacy :-). The upgraded kitchen features stainless steel appliances, granite counters with custom cabinets and is completely equipped with utensils, coffee maker, electric appliances, cookware, bake-ware and storage ware. The kitchen is equipped with all that you would expect in your own home and everything you need to conveniently prepare meals to accommodate special diets and avoid the high cost of eating out. All 4 clean and attractive bathrooms have private entrance from a bedroom and include granite counters and combination bathtub/showers. The Bathroom in the Grand Master Bedroom has double sinks and a jetted tub. Color-coordinated towels and other decorative accessories provide the finishing touches! There is also great water pressure and plenty of hot water to wash off the Gulf of Mexico at the end of the day. Ocean Ritz 1401 also features full size Washer and Dryer for those days when you need to freshen up the provided linens, towels or your clothes. That big dryer is also handy keeping the owner provided beach towels dry. The Enormous Balcony stretches outside the length of the condo with sliding door access from the Great Room and both Master Bedrooms, and features comfortable patio furniture that seats 11. It has as a outdoor dining table that seats 6 to enjoy the incredible views while enjoying a home cooked meal. Gramma and the kids will enjoy watching the Dolphins, Pelicans, people and other wildlife. In season, there is a daily parade of helicopters, boats, para sails and airplanes not to mention breathtaking fireworks displays. Some quests are totally entranced and spend their whole vacation just sitting on the balcony watching all the excitement. Rainy day or relaxing at night: Use the free WIFI to Login to your Netflix or Facebook account on any of the 5 high definition/ 3D flatscreen Smart TVs. Each TV has a 3D blue ray player attached. Use the Blue tooth enabled sound stand in the grand room to listen to your own audio from your blue tooth enabled device. We also provides a small collection of DVDS for your enjoyment. With our owner managed unit there is no need to even stop at a front desk. No corporate check in hassles at a front desk required for Ocean Ritz 1401! We normally maintain a seven day minimum Saturday to Saturday model from the last Saturday in May to the second Saturday in August. All other times it is a 3 day minimum. The front door lock features a push-button combination lock that we will program with your unique entry code valid for your stay. You can easily customize the code to something easier to remember, if you like. No problems with a physical key or magnetic card that can be lost in the sand! 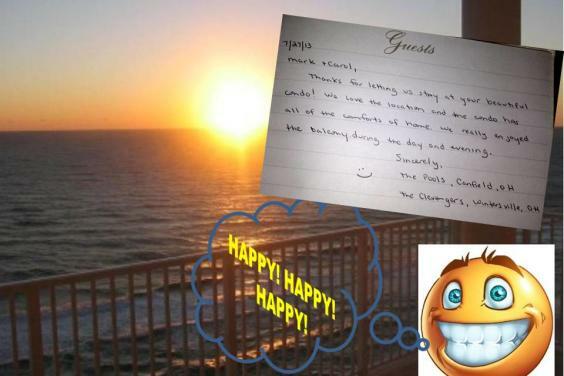 We can easily provide Ocean Ritz 1401 access to last-minute renters or guests who have lost their code by sending the codes via email or text message. Ocean Ritz armbands and 1 Ocean Ritz parking pass are included in the rent. The owners also allows quests to use their annual PCB parking pass during their stay. It allows free parking at all city operated parking lots. On site security in season helps keep your vacation as trouble free as possible. 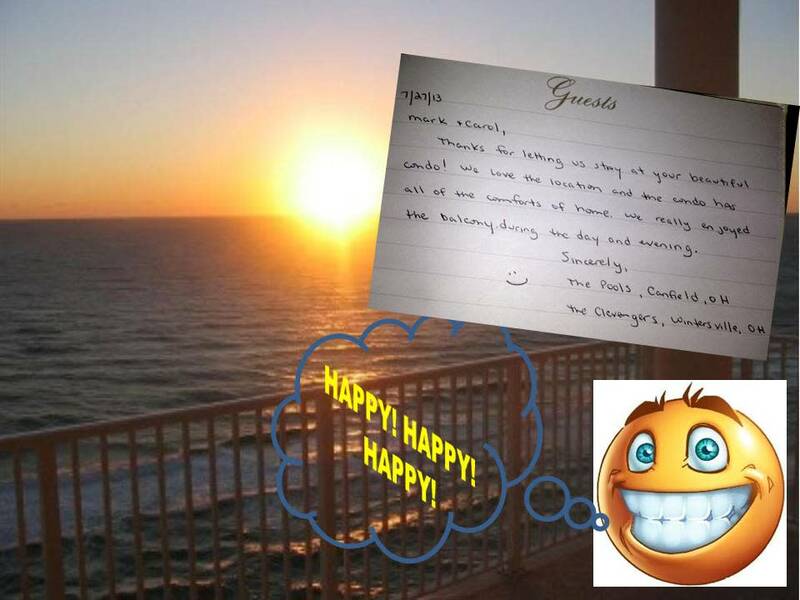 We strive to make your stay a happy one! Please come and share in a bit of fun and relaxation in our little 'Splash' of paradise - where our attention to detail and desire for your happiness 'make the difference'!